If you live with daily knee or hip pain and other treatments have not worked, our adult reconstruction specialists can help eliminate the pain and restore mobility. The Ohio State University Wexner Medical Center is ranked by U.S. News & World Report as one of the premier sites in the country for orthopedic surgery. That’s why people come to us from throughout Ohio and nearby states for their joint replacement surgery. You too can get relief from pain, stiffness and weakness in a major joint like a knee or hip here. We specialize in caring for adults in need of joint replacement (also known as reconstructive surgery or orthopedic reconstruction) due to osteoarthritis, post-traumatic arthritis, avascular necrosis and the late consequences of childhood hip diseases such as dysplasia/dislocation, Perthes disease (osteonecrosis) and slipped capital femoral epiphysis. We also lead clinical trials and scientific research projects that look for new and better ways to treat osteoarthritis and other degenerative conditions. Joint replacement is recommended for people with severe and activity-limiting pain that does not respond to nonsurgical medical management and who have some area of bone-to-bone contact in the weight-bearing joint. When you come to our office, we’ll comprehensively review your medical history, and give you a thorough physical exam. Your doctor may order a series of diagnostic imaging studies, including X-rays or an MRI (magnetic resonance imaging). An MRI provides a detailed, high-resolution image so your doctor can see the extent of your joint’s damage or deterioration. Your pain level and day-to-day quality of life are also important factors in the decision to have knee or hip replacement surgery. 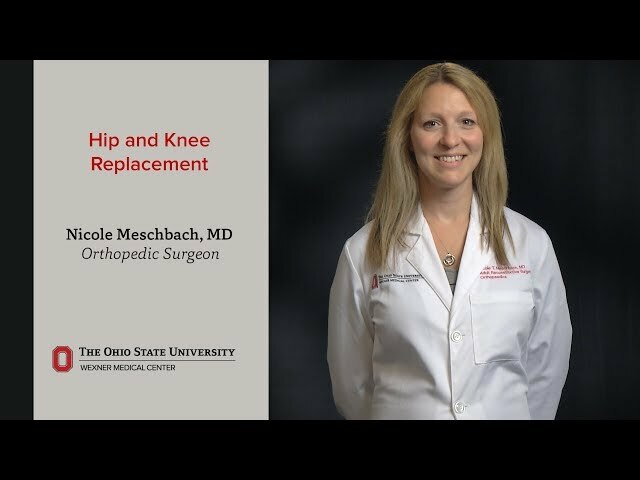 Nicole Meschbach, MD, an orthopedic surgeon, explains what to expect with hip or knee replacement or arthroplasty. When nonsurgical treatment options fail, Ohio State orthopedic surgeons can perform a minimally invasive, robot-assisted partial knee replacement. Nicole Meschbach, MD, an orthopedic surgeon, explains the preferred order of hip and/or knee replacement and the benefits of having surgery performed on one joint at a time. With total knee replacement, your doctor is replacing the joint surfaces of your knees, not the bone. Total knee replacement surgery involves replacing one or more of the knee’s three compartments (inside, outside and underneath the kneecap) with a man-made surface of metal and plastic. With partial knee replacement, your surgeon replaces only one part of your knee joint, most commonly the inside or medial compartment. You can expect to spend about two days in the hospital after knee replacement. You will be on your feet bearing weight the day of surgery. Most patients have a home healthcare nurse and physical therapist come to their house three times a week. . This is a vital part of the recovery process to help you regain your strength and mobility. You’ll engage in therapy for six to 12 weeks after surgery and will be off work for at least six weeks. With hip arthroplasty (hip replacement surgery), your surgeon will remove damaged cartilage and bone from your hip joint and replace them with new, man-made parts. You can expect to spend two to three days in the hospital, and will be bearing weight and walking the day of surgery. You should feel no hip pain other than normal post-surgical pain. Because the complication rate is lower than an anterior approach, our surgeons prefer the posterior approach to hip replacement, which involves making an incision on the backside of your hip near the buttocks to avoid the muscles in the leg used for walking. Expect six weeks of prescribed limited range of motion, along with six to 12 weeks of home health care and/or physical therapy. Why choose Ohio State for joint replacement surgery? Pioneers in Technology: We were the first hospital in Ohio to offer surgery using robotic-assisted technology. MAKOplasty® utilizes a robotic arm system that helps doctors achieve a new level of precision in knee or hip replacement surgery. Patients who have this surgery at Ohio State benefit from smaller incisions, shorter hospital stays, less physical therapy and quicker recovery time. Comprehensive Care: Our program is ranked by U.S. News & World Report as one of the premier sites in the country for orthopedic surgery. Diagnostic Expertise: We have trained experts who collaborate as an entire team, including physicians, clinicians and researchers from Orthopedics, Physical Therapy, Imaging, Sports Medicine, Nutrition and any other departments that can play a role in your treatment. We provide patients the best, most personalized treatment options available for hip and knee pain. Research: Through collaborations with Ohio State researchers and medical device manufacturers, our physicians design and develop hip and knee replacement components, including a more flexible structural device for total hip arthroplasty. We also lead clinical trials and scientific research projects that look for new and better ways to treat osteoarthritis and other degenerative conditions. Discover what can keep you moving. Request an appointment with a Robotic Total Knee Replacement specialist.